We are excited to announce that Greiner Buildings has won two Building Of The Year Awards from the National Frame Builders Association. This is a competition that pits our buildings against post-frame builders from all across America. Greiner Buildings has won first place in the Hobby Shop division with Andy Duggan’s 104′ x 72′ x 18′ lined and insulated building. Greiner Buildings has also won third place in the Commercial division with Kelly Heating & Air’s 45′ x 152′ x 19.5′ two story lined and insulated building. Both buildings are prime examples of the benefits post-frame construction can offer. Allowing customers to build a larger building with every bit of utility compared to other types of construction. 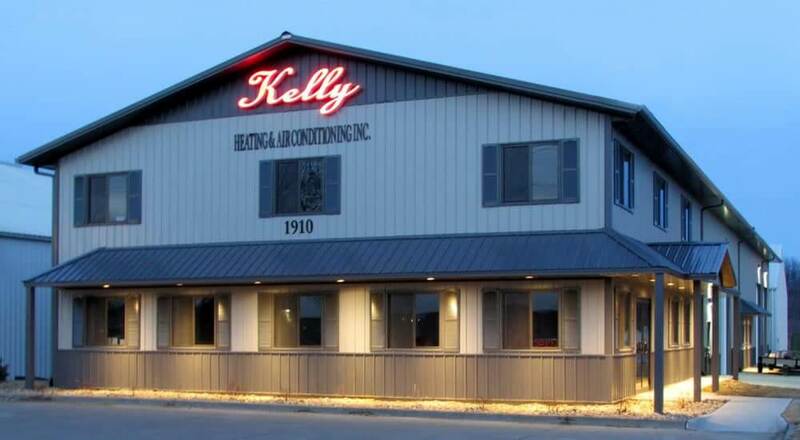 Located on a busy street in Iowa City, Iowa is Kelly Heating and Air Conditioning. It is a striking post frame building with two stories of office space in the front and a lined and insulated shop in the rear used for storing inventory and working on company equipment. Kelly Heating and Air Conditioning is a fast growing company that needed to expand to keep up with demand. With this new space, they are continuing to grow and serve even more customers throughout the Iowa City area. Kelley Heating and Air Conditioning choose post frame construction because of its value and ability to insulate it properly. Being a heating and air conditioning company they know how important insulation can be in a building. 3dviewThe building is somewhat simple, yet very sleek, elegant, and a definite eye-catcher. The color combinations and the porch design combined w/ the lighting gives it elegant appeal, especially in evening hours. The interior is very attractive also and completes the overall theme of the project. Post frame is a perfect option for 2-story construction on one end and 18′ tall warehouse space on the opposite end. It’s efficient to build 18′ tall w/ post frame That height works great for office below/mezzanine above; also for warehouse storage space.